By Ed Breslin. Thomas Dunne Books. $23.99. Dogs have an uncanny ability to become the centerpiece of our lives, and that’s exactly what Miss Dutchie, a charismatic (aren’t they all) black Labrador retriever, does with Ed and Lynn Breslin for 12 years and two months. 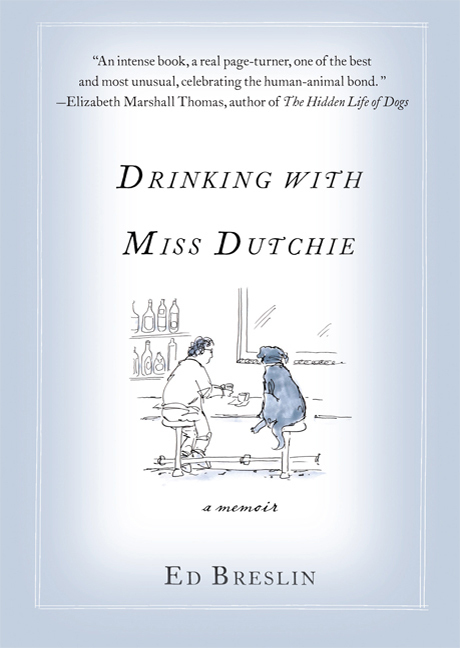 Through Breslin’s alcoholism and Lynn’s breast-cancer surgery, the 85-pound Dutchie stands tall and steady in this bookend memoir, which opens with a frustrated Breslin wanting to return the puppy to its breeder after a couple of noisy, sleepless nights. Conversely, a dozen years and numerous life-saving veterinary procedures later, it’s a slow, tearful letting-go of this once-vibrant animal that has been rendered essentially a quadriplegic in its final days. The New York City professional couple often find themselves separated in the city or country by work demands, hence the unflappable Dutchie is going in both directions with a “bring-it-on” attitude. Dutchie’s life can be categorized into two halves divided by an ACL surgery in which she has artificial ligaments inserted into her right hind knee at age 7. Thereafter, this once robust animal ages rapidly, later suffering from breathing problems that are diagnosed as laryngeal paralysis, accelerating her downhill health spiral. The dynamics of the pair’s endearing relationship with Dutchie are best manifested in the closing chapters, which focus on its never-ending, yet gut-wrenching commitment to preserve a quality of life for the heart of the family. Packed with passion and persuasion, the sharply etched portrait captures the powerful psychological role of the human-animal companion bond. In that respect, this celebration of life should serve as a refreshing source of inspiration to every reader who picks it up.